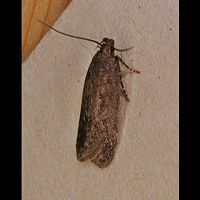 The Cinerous Neb is a rather indistinct brown moth, looking like many brownish moths in this family. The two black dots on the wing are they best way to identify this species, but be aware of look-a-likes. The wing span is 14 to 16.5 mm. It flies by night only. Adults however do rest in long grasses and may be disturbed during day time, in which case they readily fly away. The caterpillars are difficult to spot. They live within a silken tunnel, from which they eat the host plant and rarely ever show themselves. The caterpillars are brownish red and have a black head. They feed on mosses mainly and are reported from Springy Turf-moss, Sand-hill Screw-moss, Heath Plait-moss and Pointed Spear-moss. 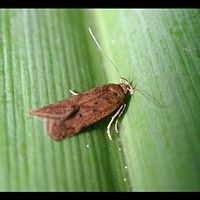 Also reported from grasses, mainly Common Bent. Adults fly about from May to August. The Cinerous Neb is a common species all over Europe, including all of Britain. 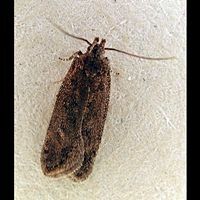 Exact numbers are hard to tell because it is often overlooked because of its resemblance to other species in the genus. This page has last been modified on Saturday, November 10, 2018.